The GPYHA/RI Special Needs Hockey program offers Learn to Skate/Instructional Hockey for children age 4 to young adult with Down Syndrome, Autism, or any other developmental disability. 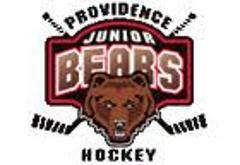 Ice sessions are held Saturday mornings at Lynch Arena in Pawtucket, RI, starting in late October and ending in March. No previous skating experience is required; enrollment is open throughout the season. The program is open to any boy or girl who is physically able to play, but would be unable to participate in any other organized program due to his or her developmental disability. Players must be free from any physical or medical condition that could cause them to do harm to themselves or to other participants during participation. The minimum equipment required for the program will be skates (single blade hockey skates) and a hockey helmet with face mask. We have historically found that players who have elbow pads, knee pads, hockey pants (with the standard tail-bone pad) tend to get up smiling when they fall – a great motivator for new skaters! Private individuals have generously donated some used hockey equipment for participants in the program. Special Hockey Brown Event Recap! Thank you to the Brown Men's hockey team for a fantastic day! Meet Coach Shawn from RI Special Hockey! College Day for Special Hockey a Great Success! RI Special Hockey thanks Brown, J-W and URI players for their support! RI Special Hockey Featured in Providence Journal!